For our action project we are asked if we had a chance to reshape a public place in Chicago to make it better in my city, what would it be and what would we do? I decided to take on an issue in my new neighborhood, the South Loop. Below is my issue and ideas on solving. Having lived in Chicago my entire life I am very excited to experience the dynamics and diversity of this unique neighborhood. There is however one particular issue I would like to bring to your attention. I think I have some interesting and different ideas on solving a unique problem. The most glaring issue is an empty gravel lot immediately across from my apartment building between State and Michigan It is full of cars parking during the day, but as the day goes on the cars disappear and different groups gather to just hang out in the lot. Having grown up in the city I know to be aware of my surroundings, be cautious at all times and have never been fearful walking around after dark. However walking past this area at night is intimidating and unsettling. Add that to the reports of crime in that immediate area it makes many of us uncomfortable in our own neighborhood. Have the owners build a parking garage(structure) This will eliminate loitering as the only way to enter would be driving a car. The owner could add on a few stories (depending on the city code for that lot) and the addition of extra spaces will add extra income which will help pay for the construction expense. I have considered other ways of getting people to park in this garage. We could make it very different. We have many Art schools in this area. How about letting the student use the walls as a canvas and create tasteful, incredible art pieces on the walls? 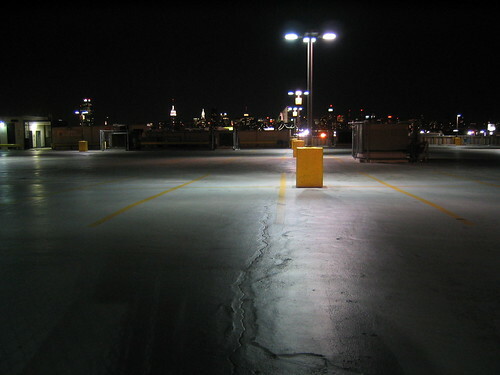 Make sure it is very well lit so parking patrons feel secure. I really think we could do advertising without any money spent. First word of mouth. Tell schools, students neighbors, everyone and anyone about this incredible unique parking facility. How about making less for students? It may sound like more money will be lost but I believe in actuality more parker’s will be gained and therefore fill more parking spaces, in turn more money will be made. Use the Art student for unique signs and sayings. We have a dense population of incredible talent in this area, for a small parking discount – no money paid out – use their talents. Sell packages. for example pack of 10 for eight to ten hours charge ‘x’ amount of money, set of 10 overnight packages for ‘x’ amount of money. Make little less than competition and they will come. College kids are happy to save a few dollars, neighbors will also be thrilled with savings. Make the garage so unique the media would be interested in putting it on the air. Maybe once a year have a general update, clean-up party at no charge to garage owners as a thank you. It would bring the community together, everyone would feel safer, parker’s would save money, garage owners would get free publicity (which would carry over to others parking facilities they own). They would be helping make the neighborhood more safe. The initial cost of construction will more than pay for itself in what I believe a short period of time. Everyone will feel good about their involvement in our great neighborhood. Together we can accomplish much. I think this is a unique exciting concept that just might work. 14 Apr This entry was written by GL, posted on April 14, 2013 at 11:45 pm, filed under Policy and tagged Chicago, Culture, Elements, Experience, garages, GCE, GCE Highschool, Goals, policy, School, space. Bookmark the permalink. Follow any comments here with the RSS feed for this post. Post a comment or leave a trackback: Trackback URL.